Of the commonly-used step-up and step-down topologies, those that produce low EMI are the most desirable for automotive LED driver circuits, says Keith Szolusha, applications engineering section leader, Linear Technology. Many automotive LED driver circuits require constant-current DC/DC converter topologies that can both step-up and step-down the input-to-output voltage. The non-isolated LED driver topology options are four-switch buck-boost for very high power and efficiency, coupled or uncoupled single-ended primary inductance converter (SEPIC), single inductor, buck-boost mode, and positive-to-negative (buck-based) single inductor buck-boost. None of these LED driver options has both a truly low input and low output ripple. The need for such a converter has led to the creation of a new topology. The new boost-buck (boost-then-buck-mode) floating output LED driver features low input ripple and low output ripple due to the input-facing and output-facing inductors (or coupled windings). In different ways, it resembles the single inductor buck-boost mode, a single-switch-node SEPIC, and a positive version of a Cuk converter that also has low input and low output ripple. The overall size of the combined boost-buck inductors (or coupled inductor) is similar to the single inductor of buck-boost mode. The input ripple is similar to a SEPIC, but the output ripple is much smaller. The inductor size is the same as a SEPIC, but with a single switch node instead of two (a smaller hot-loop) and without a coupling capacitor between the two windings. The input and output ripple resemble that of a low-input and low-output ripple (inverting) Cuk converter, but again, without the coupling capacitor between the windings and, most importantly, without the need for negative-referenced circuit feedback architecture. The positive boost-buck can be built with available boost LED drivers, such as the LT3952, new from Linear Technology. The new single switch 60V monolithic LT3952 LED driver with 4A peak switch current can be used as an automotive boost-buck LED driver (Figure 1). This 350kHz, 1A LED driver can power between 6.0 and 18V of LEDs from a 9.0 to 36V input with up to 90% efficiency at maximum load. Boost-buck converter efficiency is high, due to the powerful internal MOS switch. The efficiencies with different LED string voltages is shown in Figure 2 Like other LED drivers, the single, low-side power switch architecture can be used to power floating output step-up and step-down converters such as boost-buck and single inductor buck-boost mode. The LED string’s voltage reference to ground is not necessary, since LED output is visible light only, making the floating LED driver topologies, such as boost-buck and buck-boost mode are possible. The ability to PWM dim the floating LED string with the floating top gate ‘TG’ pin PWM MOSFET driver fits nicely with floating LED loads. 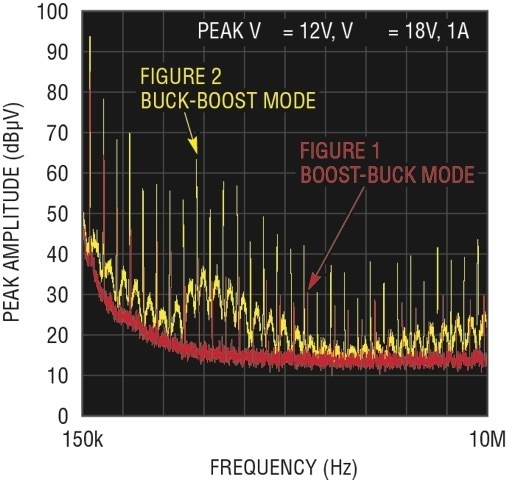 The boost-buck in Figure 1 can PWM dim at ratios of 300:1 and higher (with 120Hz frequency. The high-side TG driver provides PWM dimming to boost, SEPIC, buck-boost mode, buck mode, and boost-buck LED drivers. It even doubles as a short-circuit protection disconnect to protect against the dreaded LED+-to-GND incident. The LT3952 protects against, and reports, short-circuit and open LED conditions in boost-buck topology. Boost-buck LED driver topology can both step-up and step-down the input-to-output voltage as it regulates the LED current. Boost-buck duty cycle, efficiency, switch current, and OUT node voltage are the same as both single inductor buck-boost mode and SEPIC. Figure 3 demonstrates the reduced conducted EMI of boost-buck versus buck-boost mode. The separation of input and output windings prevents the output ripple current from coupling on the input capacitor of the boost-buck, thus reducing EMI. The EMI of Figure 3 shows low AM band EMI from 530kHz to 1.8Mhz and less of a need for a large EMI input filter. Figure 4 demonstrates an alternate drawing of the boost-buck topology, demonstrating the low in-and-out ripple paths in contrast to the SEPIC converter that does not have the same low output ripple. High ripple on input or output lines can radiate and increase EMI, especially if those lines are several meters long. 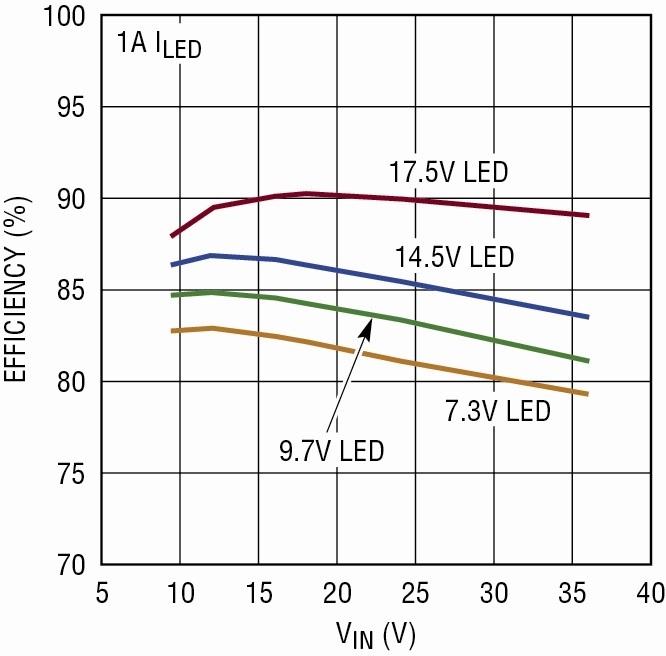 Additional LC filtering on the output of an LED driver is not recommended since it may inhibit optimal PWM dimming performance by slowing down PWM transitions and causing unwanted ringing. The low ripple, output-facing inductor yields the best combination of PWM dimming performance and low output EMI, like a buck. Note that the positive-to-negative single inductor buck-boost converter also has low output ripple and high bandwidth, but its input ripple and output ripple is notoriously coupled into large system input capacitance, creating larger than desired conducted EMI. Both the input and output capacitors in the boost-buck topology filter low triangular ripple current equal to ILpkpk/sqrt(12). A little more capacitance or inductance can further reduce EMI in this topology. Neither the input or output capacitor is crucial in the converter’s high dI/dt hot-loop. In this topology, the critical hot-loop is constrained to the catch diode, OUT-to-GND capacitor, and the internal low-side switch (Figure 4), simplifying the layout. When the two inductors of the boost-buck are tied together and the LED- node is connected to the input, the boost-buck is converter back to a buck-boost mode converter. In this scenario, the hot-loop currents and the input and output ripple currents can find their way onto the input and output capacitor alike, resulting in higher input and output ripple measurements. The LT3744 positive-to-negative boost-buck (boost-mode-then-buck) is also a low input and low output ripple LED driver, but uses a synchronous step-down converter with negative regulation capability. High efficiency is a major strength of a synchronous switching IC, especially when a high power LED string is driven such as the 3A, 48W LED load in Figure 6. 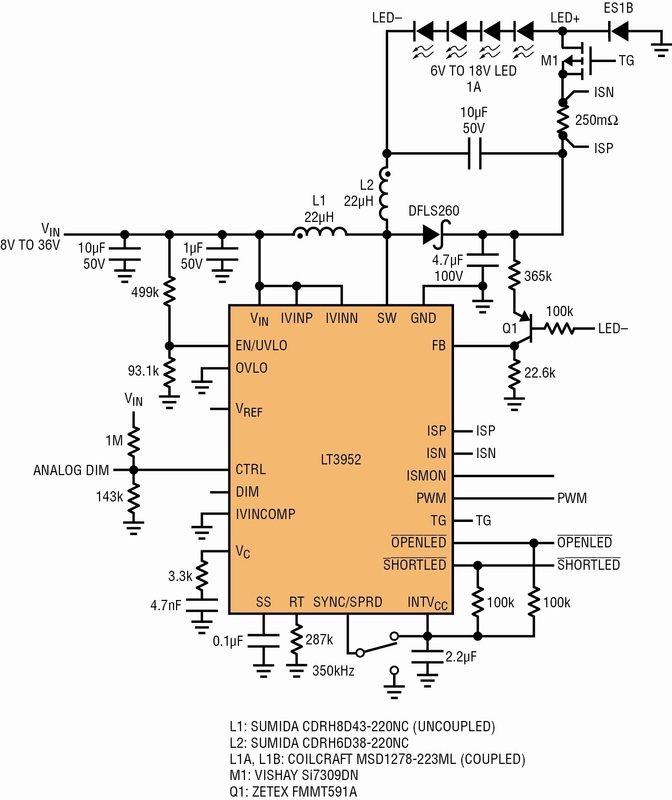 Synchronous step-up and down boost-buck LED drivers are possible with both synchronous boost and buck LED drivers. LED drivers such as the LT3952 and LT3744 can be used for both simple and high power LED strings in automotive and industrial applications where high power and low noise are crucial without a sacrifice of PWM dimming performance.